Massive arborescent pachycaul to 6 m tall; stem erect, to ea. 40 cm diam. At base (thickening with age), distally to ea. 15 cm diam., older parts developing tessellated 'bark'; leaves several together, more or less erect; petiole to ea. 1.5 m long, yellowish to dark green mottled chocolate, sheathing in the lower third; blade sagittate and deeply pinnatifid, dark green, coriaceous; anterior lobe to ea. 1.5 m long, with up to 10 linear-lanceolate roundtipped segments each with a primary lateral vein diverging from the anterior costa at ea 80-90°; margins strongly crispate; primary veins prominent below, tinged purple-brown or yellowish, with conspicuous axillary glands on abaxial side; secondary venation flush, arising from primary at ea. 80-90° and interspersed at ea. 2-3 cm intervals with abaxially slightly prominent stronger veins (but nearer in size to secondary than primary) with glands in their axils; inflorescences in numerous pairs clustered in the centre of the leaf crown, subtended by conspicuous brown-mottled lanceolate cataphylls; peduncle to ea. 30 cm long; spathe to 40 cm long; lower part subcylindric, dark brownish green, ea. 5 cm long; limb linear oblonglanceolate, at first erect and canoe-shaped and cucullate, thence reflexed at the constriction, pale brownish, mottled and streaked chocolate brown, membranous; spadix somewhat shorter than the spathe, to 32 cm long; female zone sessile, ea. 4 cm long x 1.5 cm thick; ovaries subglobose, ea. 2.5 mm diam. ; style very short; stigma weakly lobed; sterile interstice ea. 2 cm long, narrowed, corresponding with spathe constriction, white; male zone whitish, ea. 8 cm long, cylindric, ea. 1.5 cm diam. ; synandria rhombohexagonal, ea. 1.2 mm diam. (dry); thecae capped by synconnective; appendix basally slightly thicker than male zone, then subcylindric and distally tapering; fruiting spathe ovoid, ea. 10 cm long x 5 cm thick. Endemic to the Philippines; Luzon. 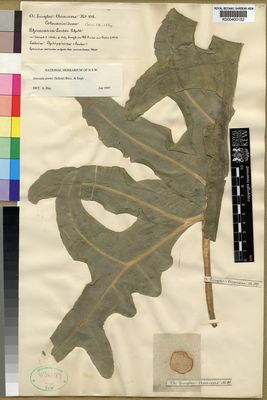 However, A. portei is anecdotally reported to be common and widespread in the Philippines, although botanical collections have been made on only very few occasions, probably on account of its enormous size. Secondary forest at low to medium elevations.